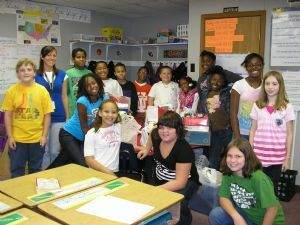 Josie Rocco and Lynette Nelson delivered school supplies and a DVD player to the Laketown Elementary 5th grade classroom at the beginning of School Year 2009. Josie reports that everyone was very excited with the bounty, as you can see by the smiling faces in the photo! Well done, Rotarians! Thanks for your contributions to this terrific service project.